With a Terrafugia Transition you can drive to the airport and fly to your destination -- without leaving the driver's seat. It's a two-seater with a four-cylinder engine, a continuously variable transmission and front-wheel drive. There's room for skis, fishing poles and golf clubs. And its standard safety equipment includes a parachute. 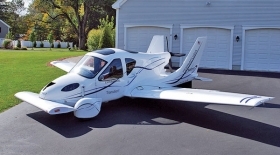 We're talking about the $200,000 Terrafugia Transition, a flying car that could take to the road and air late in 2011. According to the company's Web site, terrafugia.com, the vehicle has been designed by aeronautical engineers and has a range of 500 miles. Richard Gersh, a Terrafugia vice president, says the company has built and flown a concept of the vehicle he calls "a roadable aircraft." It can use any public airport that has a runway at least 2,500 feet long. Once the vehicle is on the ground, the driver/pilot presses a button and the wings fold up so the car can be driven on the road. Terrafugia says it fits in a normal-sized garage. Gersh said the car has airbags and meets most federal auto safety standards.